Europe is among the major regions contributing to the global heparin market owing to its developed economy and high prevalence of coagulation disorders. According to the Ageing Report published by the European Commission in 2015, the percentage of population aged above 65 years is expected to increase from 21.0% in 2013 to 32.0% in 2060. Aging is directly proportional to the rising incidence of venous thromboembolism (VTE) diseases such as deep vein thrombosis (DVT) and pulmonary embolism (PE). Hence, the demand for heparin in Europe is expected to increase in the next few years. 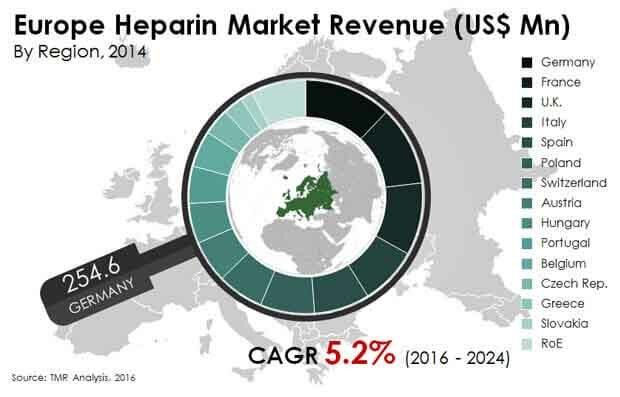 The heparin market in Europe was valued at US$2.2 bn in 2015 and is projected to expand at a CAGR of 5.2% from 2016 to 2024 to reach US$3.5 bn in 2024. Based on end user, the heparin market in Europe has been categorized into hospitals, blood and stem cell banks, and others. Hospitals and clinics widely use heparin as a blood thinner in the treatment of various diseases related to cardiovascular, cancer, and orthopedic. Heparin such as Calcilean, Calciparine, Hepalean, Heparin Leo, and Hepalean-lok are prominently used in hospitals for surgical purposes. The hospitals segment accounted for a major share of the heparin market in Europe as most surgical procedures are often performed in hospitals. The blood and stem cell banks segment also held a significant share of the market in 2015. Blood and stem cell banks use heparin to collect cord blood and stem cells as heparin promotes the growth of human embryonic stem cells in a defined serum-free medium. The heparin market in Europe has been segmented on the basis of geography into the following major markets: Germany, France, the U.K., Italy, Spain, Poland, Switzerland, Austria, Hungary, Belgium, Portugal, the Czech Republic, Greece, Slovakia, and Rest of Europe. Germany accounted for the leading share in the heparin market in Europe in 2015 and is expected to continue its dominance till 2024. Key attributes to the market growth in Germany encompass burgeoning incidence of VTE among patients, resulting in the increased demand for heparin. Moreover, stringent regulations pertaining to Chinese active pharmaceutical ingredients (APIs) due to adulteration issues have attracted new players to the heparin processing and manufacturing business in Europe. Europe has been known to adhere to strict regulations pertaining to the import of heparin. For instance, in 2013, Germany-based meat company, Tönnies GmbH & Co, acquired Pharma Action, a heparin API manufacturer, and proposed to manufacture 30 metric tons of heparin API. Such developments are expected to augment the heparin market’s growth in Germany. France, Belgium, and Portugal are anticipated to register the highest growth in the coming years. France also held the second position in the heparin market in Europe in 2015. Heparin consumption during and after surgical procedures such as knee replacement, hip surgery, appendectomy, and breast surgery is higher in France as compared to Italy, Spain, and the U.K. The increased risk of thrombosis among the geriatric population is also expected to drive the market for heparin in France. Major players in the Europe heparin market include Sanofi SA, Pfizer, Inc., Leo Pharma, Teva Pharmaceutical Industries Ltd, and Dr. Reddy’s Laboratories.